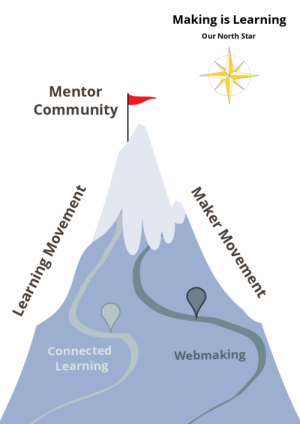 We’re at **an inflection point with learning and making. ** What was once simmering quietly in makerspaces and classrooms is now boiling. **Makers and mentors,** and all sorts of hackers and radical educators in between, are the key players. There’s also another movement reaching critical mass: **a learning movement. ** It’s teachers, educators, museum curators, after school coaches – in short, **mentors who cop a DIY attitude towards learning. ** Similar to the maker movement, they care about tinkering and interest-driven projects. They care about making, not rote memorization or other staid pedagogies of the past. They blend online and offline experiences, they focus on peer learning, and they are challenging traditional educational institutions with new modes of assessment and accreditation. These two groups, the makers and the mentors, are coming together. **And they’re creating a smart grid for learning. ** If it all goes well, it will shake up education, it will shake up employment, and it will shake up the way we see and tinker with the world. By social learning, we mean that **learning happens effectively through social interaction among peers. ** It’s learning that has an impact beyond an individual and become part of the larger society or community, in response to interactions with the community. By mentoring, we mean **peer support and encouragement where someone helps another person learn or make something,** and also to understand that effort in a larger context. Mentoring is social and open-ended, and it’s certainly not just a one-way transfer of knowledge. We think a focus on mentoring is important, as it provides ongoing relationships for learners and a way to foster not only “hard” web skills like learning code but also the social ones like collaboration or working in the open. We’re not doing this alone — **it’s a huge, distributed collaboration across many organizations and individuals. ** A **”big tent”,** as we like to call it. From kitchen tables and small code clubs to edgy museums and international bodies, we see this as a group effort where many players have a role. This group will operate like a **skunkworks incubator for radical ideas** about learning, webmaking and mentoring. We’ll bring **new Hive learning networks online**. The goal is to mobilize local communities and network them globally. These efforts will be **powered by platforms and social protocols** for people to gather and teach skills for a digital age. We aspire to **build a Github for Learning Stuff**, an open repository where mentors can rip, remix and repost materials. These milestones come from conversations with community members (thank you! ), and we tried to roll that input into an action plan and share it back with you. * Surface localization opportunities. Tools and starter content should all eventually be translatable for different communities. * Webmaker.org/mentor is a destination for mentors. It includes community stories, remixable resources, events, and a marketplace for needs and offerings. * Remixable hacktivity kits released. Mentors are regularly ripping, remixing, and reposting content to Webmaker.org. [Early iterations already online](http://hivenyc.org/index2.html). * “Making as learning” narrative is widely known and has momentum. [Some initial thinking by Mark Surman](https://commonspace.wordpress.com/2012/11/26/makingislearning/). * Participation metrics for campaigns are hit. [We had an amazing turnout last year](https://webmaker.org/en-US/hall-of-fame/). * Hive Cookbook used to grow & on-ramp new learning networks. 3+ new cities at a Hive Learning Network stage. [Check out our recipe for a Hive pop-up](http://heatherpayne.ca/what-is-a-hive-pop-up/). Join the Webmaker mailing list. Connect with others mentors, ask questions, and find out what other mentors are up to. Introduce yourself. Live chat. Pop into the #webmaker public chat room to say hello or ask questions. Share and build with us. Contribute back your own learning resources, remixes and more. We warmly welcome your feedback on the Webmaking mailing list or in the comments to this post. Can’t wait to kick off this work with you!